Gap Inc. (GPS) posted fourth-quarter profit that jumped nearly 45%, topping analyst expectations, as the parent of Banana Republic and Old Navy enjoyed higher merchandise margins than the year-ago quarter. The San Francisco-based company reported a profitable a full year 2009 and said it will start to go after market share and sales growth in 2010, both in the U.S. and new markets abroad. Despite its healthy results in the U.S. during the fourth quarter, management said it will focus its new-store activity overseas, with new markets in Italy and China this fall. In the U.S., it will focus on remodeling stores to put in place its new prototype design, beginning with Old Navy's locations. For the fourth quarter, the company reported earnings of $352 million, up 44.9% from $243 million during the same period in 2008. Earnings per share 52 cents beat analysts' estimates of 49 cents. For the full year, net income rose to $1.1 billion from $967 million in 2008, up 14% year-over-year. Comparable sales were up 2% in the fourth quarter, led by a 7% increase at Old Navy, while Banana Republic's comparable sales in the U.S. were down 2% during the quarter, and U.S. Gap stores were down 1%. For the full year, sales were down 3%; Gap was down 7%, Banana Republic dropped 9% and Old Navy's comparable sales rose 4%. The profit improvement was a result of higher merchandise margins that helped gross profits grow by 20% during the fourth quarter and 5% for the year. Gross margins rose by 5.5 percentage points between the fourth quarter of 2008 and the same period in 2009. Gap has been on an overhaul process for the last five years, trying to build up its three brands and set them apart from each other. The recession hit that effort hard, especially the flagship Gap brand, while the lower-priced Old Navy remained popular with thrifty shoppers. But now that the economy has begun to stabilize and the new corporate structures are in place, Gap Inc. will be focusing on market share, said CEO Glenn Murphy. Executives tried very hard to reassure analysts during a conference call that any efforts to expand stores or marketing won't dilute profit growth. "The money only goes when there is a justifiable strategic reason and can quantify the return," said Murphy. 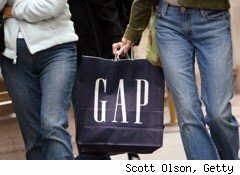 Gap's forecast for 2010 calls for earnings of $1.70 to $1.75 per share, but the company did not give any forecast for sales. Gap will be spending more on marketing and product to expand inventory in early 2010 and sales. But executives said the company is determined to hold costs down and has worked with vendors to keep the cost of goods low to protect profits. The company also announced it will use some of its excess free-cash flow to increase its dividend for the 2010 fiscal year by 18% to 40 cents per share, and authorized $1 billion in share repurchases. Gap will open 65 new stores, weighted heavily toward outlets and international locations. China and Italy stores will open in fall, and Gap also plans to expand its online shopping functions to Canada and European markets. The first store in Italy is expected to open in Milan, followed by other cities, including Rome, in 2011. Gap plans to close 110 stores during 2010, mainly domestic Gap locations. Among domestic stores, Gap Inc. plans to remodel more Old Navy stores to implement a new prototype design meant to make them more shopper-friendly. Sixty stores were remodeled in 2009 and another 180 will follow in 2010, mainly during the first half. New prototypes for Gap and Banana Republic are also being tested and outlets will be remodeled, as well, said Murphy. A "handful" of other Banana Republic stores will be remodeled, he said, but didn't specify how many. Murphy said Gap Inc.'s units have all identified rivals and categories they can draw market share from, and have plans sketched out to make that happen. He added that, for competitive reasons, he could not give any more detail on those plans. Gap Inc. was "a defensive retailer" between 2003 and 2007, but now it's time to stop talking about turnaround plans and move into taking market share, he said. "We can now evolve the business and talk about how the business is going to grow and go forward and win," Murphy said. "We need and we will gain market share in 2010."